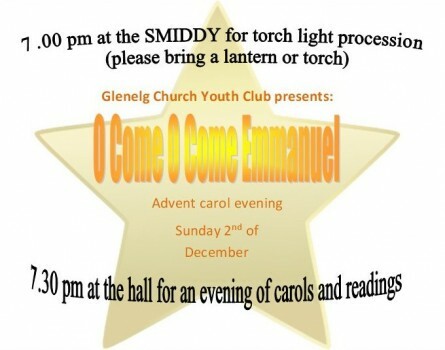 The Christmas season kicks off this Sunday, 2nd of December when the Church of Scotland youth club hosts a Christmas Advent Carol Service in the Glenelg and Arnisdale Community Hall. The evening starts at 7.00pm with a torchlight procession from the Smithy junction down to the Hall where the main carol service will begin at 7.30pm. There will be input from the children and youth of the community, as well as the singing group. There will also be hot drinks and seasonal snacks provided! All ages are very welcome. Donations will go to the Scottish Housing Action Group, who work with the homeless, a very worthwhile cause, particularly at this time of the year. Ps: Don’t forget you torch or lantern! !